The Joint Task Force (JTF) in the Niger Delta codenamed ‘Operation Pulo Shield’, has arrested six suspected pirates involved in Friday night’s attack on its base in Nembe, Bayelsa State, in which four soldiers and a policeman were killed. According to a statement issued by Lt.-Col. Isa Ado, the spokesperson of the JTF in Yenagoa, the Bayelsa State capital Sunday night, troops also destroyed a militants camp during the raid. “JTF in a swift reaction to the 7 August 2015 attack on the JTF troops along Nembe Community in Bayelsa State has carried out a cordon and search Operation in suspected Militants camps responsible for the attack at Ke Community in Degema Local Government Area of Rivers State. “The militant camp was destroyed by JTF troops while six suspects comprising of four males and two females were arrested. “Large quantities of arms and live ammunition were also recovered from the camp. “The arrested suspects are in custody of the JTF and are helping the Task Force in the investigation that will lead to the arrest of other fleeing suspects and their sponsors”, Ado said. According to the JTF spokesman, other items recovered from the militant camp include three speed boats, communication gadgets and generators. He said the JTF was hot on the heels of other fleeing suspects and in no time will catch up with them and bring them to justice. “The JTF will continue to dominate the creeks and waterways of the Niger Delta Region and will not rest until the perpetrators of this heinous act are apprehended. 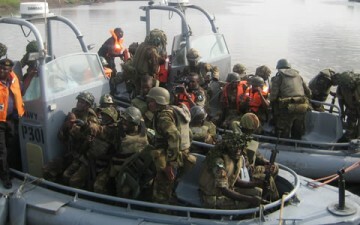 “The JTF also use this opportunity to call on people with credible information that will lead to the arrest of other fleeing suspects to come forward with it to enable the Task Force carry out its operation effectively in line with its mandate and Zero Tolerance Campaign against all illegalities in the region”, the JTF stated.